Exponential urbanization and tremendous employment opportunities have made NCR one of the fastest-growing regions in the country. It is the largest urban agglomeration in India, with more than 28 million urban residents (around 7.5% of overall country’s urban population). The accelerated urbanization and rampant migration of working population from different states have created a tremendous need for affordable housing in NCR – and the requirement keeps growing. 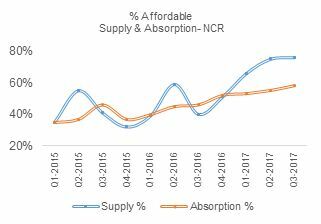 A recent ANAROCK report shows that NCR comes out on top in terms of the number of units added in the affordable housing segment (priced < INR 40 lakh) during the last two years, and accounted for around 26 to 30% of the overall affordable housing segment’s supply across the top Indian cities. The region’s share of new launches in the affordable segment has grown from a mere 21% in 2012 to 71% in 2017 (up to Q3). While the entire region possesses the opportunity to shine in this segment, ANAROCK’s report has identified some pockets which qualify as the key destinations for affordable housing projects in NCR. 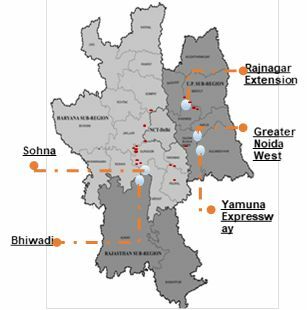 These pockets include Sohna (Gurgaon), Rajnagar Extension (Ghaziabad), Yamuna Expressway & Greater Noida West (Greater Noida), and Bhiwadi. These five precincts together accounted for 48% of NCR’s affordable housing supply (2012-Q3 2017) and added around 1.3 lakh units. They also constitute a major share by accounting for around 45% of the total supply in the region during the same period. While the average prices in NCR are between INR 4,200 to 4,600/sf, they are significantly lower in these pockets with a range between INR 2,800 to 3,900/sf. These precincts not only offer a wide spread of options for affordable and mid-segment buyers but also possess significant growth potential over the mid-to-long term. Sohna is likely to be the next emerging satellite town due to proximity and connectivity to Gurgaon and other regions of NCR along with upcoming developments in the vicinity. It accounts for about one-third of affordable supply in Gurgaon. More than 80% dwelling units’ supply in Bhiwadi, a hub of several industrial and logistics establishments, is in the affordable segment. Excellent connectivity and good commute options to Noida & Delhi make Rajnagar Extension a key hotspot for affordable housing buyers. Formerly known as Noida Extension, Greater Noida West enjoys the advantage of proximity to Noida, Delhi and Ghaziabad – the established real estate destinations of NCR. Yamuna Expressway, a new entrant in real estate market, has turned out to be one of the top affordable markets in Greater Noida in the last two years, accounting for around 43% of affordable supply as of Q3-2017. The upcoming airport in Jewar and connectivity to the eastern parts of Uttar Pradesh will aid future growth in this market. In a nutshell, NCR – also called the ‘growth engine of North India’ – with its emerging precincts is likely to emerge as a one of biggest affordable housing destination in India.